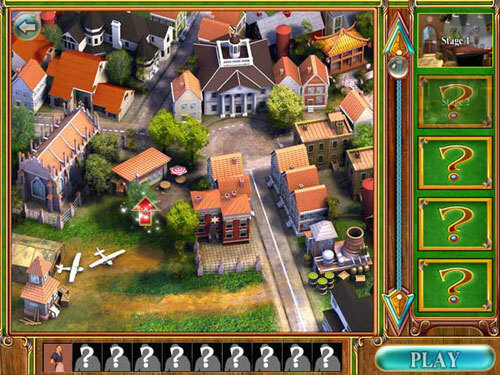 If you've already solved the current batch of Mystery Case Files Games, Mysteryville might be exactly what you're looking for to fulfill that puzzle solving mind. It's not exactly fair to compare the game to Mystery Case Files, but the game presents challenges that make it stand alone as a fun puzzler. The setup is you play the role of an ace reporter for the town paper, tasked with getting the story about why the cats in the town are all disappearing. The puzzles lead you through a series of clues to help you get to the bottom of the missing cats caper. As you progress through the 20 levels of the game, the story takes a number of strange turns as you encounter an FBI agent, a mad scientist and a man in a dark suit, along with a handful of other oddities. If you haven't played the Mystery Case Files series, be sure to play Mysteryville and download one or all of the other titles for tons on perplexing puzzle fun. Be sure to try Pirateville and the sequel Mysteryville 2.